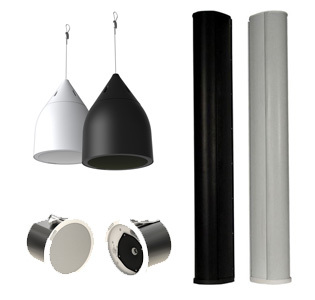 We offer a comprehensive family of ceiling, surface mount and pendant loudspeakers designed to meet the needs of installations requiring high performance at a competitive price. The Speaker models offer a wide range of choice from 4.5-inch, 6.5-inch and 8-inch driver sizes, and deliver exceptional speech intelligibility and proven reliability. The entire product family features uniform sound quality throughout the series, providing excellent consistency from model to model. Our speaker system provides an affordable solution to unobtrusively provide even coverage and great sound quality from zone to zone throughout an entire venue. All speaker models feature a Euro block input connectors, external loop-through wiring design, weather-treated drivers, and corrosion-resistant dual-layer powder coated grilles. All the speakers can be painted to match room décor and are equipped with a built-in auto transformer for selectable 8 ohm or 70V/100V operation.